declassé material as animated cartoon shorts — until Disney came along, and started showing the world that animation was a form of art. The studio's first shot at animation was to approach Disney himself, hoping to distribute his cartoons the way Paramount distributed Max Fleischer's. They failed, but did sign up Disney's ex-partner, Ub Iwerks, when Iwerks struck out on his own in 1930. 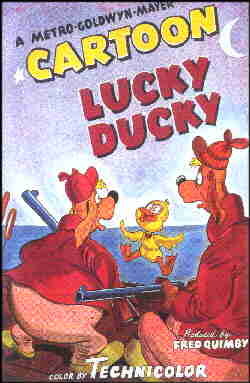 The resulting cartoons, starring such characters as Flip the Frog and Willie Whopper, didn't make much of a hit with audiences; and Iwerks was back at Disney within a couple of years. They next went for a couple of other ex-Disney men, Hugh Harman and Rudy Ising, who had recently been supplying cartoons to Leon Schlesinger, who in turn supplied them to Warner Bros. Harman and Ising brought their successful character, Bosko, with them, but their main job at MGM was the "Happy Harmonies" series, a knock-off of Disney's Silly Symphonies. MGM's first Harman-Ising release was The Discontented Canary, which came out on September 1, 1934. Quimby's first act as producer was to hire as many Harman-Ising staffers as he could; and his second was to raid other animation producers' staffs. For characters, he licensed The Captain & the Kids, a successful United Feature comic strip, on grounds that anything appearing in so many papers must be pretty good. The series flopped as a cartoon, tho the comic lasted another 40 years. But the staff he put together (even Harman and Ising came back in 1939, and stayed a couple more years) eventually started putting out some pretty decent cartoons. MGM's first home-grown star, Barney Bear, debuted on June 10, 1939. The studio's first Oscar nominee, Harman's Peace on Earth, perhaps the first cartoon from a major studio with a completely serious theme, was released December 9 of that year; and its first winner (in fact the first non-Disney winner of all), Ising's The Milky Way, came out on June 22, 1940. Even more significant was a cartoon released February 10, 1940. Puss Gets the Boot was the first appearance of the characters who quickly evolved into Tom & Jerry (no relation to the Van Beuren Tom & Jerry). Tho Quimby, characteristically, didn't care for Puss Gets the Boot very much, it made so big a hit with viewers, its directors, Bill Hanna and Joe Barbera, did practically nothing but more Tom & Jerry cartoons for the next decade and a half. They won seven Academy Awards for those characters (Yankee Doodle Mouse (1943), Mouse Trouble (1944), Quiet, Please (1945), The Cat Concerto (1947), Mouse Cleaning (1948), Two Mouseketeers (1952) and Johann Mouse (1953)) and were nominated for two more (The Night Before Christmas (1941) and Hatch Up Your Troubles (1949)). In fact, the Hanna/Barbera team's only other Oscar nominee was Good Will to Men (1955), a Cinemascope remake of Peace on Earth. Tex Avery came to MGM in 1942, bringing the studio another Oscar the same year with his very first release, The Blitz Wolf. Avery's characters included Screwy Squirrel, who didn't make a very big splash, and Droopy, who did. But his biggest splash there was made with a loose-knit series of fairy tale send-ups, starting with Red Hot Riding Hood (1943), in which a lust-crazed wolf repeatedly goes ga-ga over a gorgeous redhead. But most of his MGM cartoons didn't have any continuing characters at all to rein in his zany imagination. It went on that way for years, with Hanna and Barbera heading up one unit and Avery, assisted by Michael Lah, another. A third unit produced a few Barney Bear cartoons in the late 1940s, but it soon fell to budget cuts. Avery left in 1954 and Lah took over his unit. The following year, Quimby retired. Hanna and Barbera inherited his position, but their tenure was short. In 1957, increasing costs and competition from television led MGM to shut down the entire cartoon operation. Hanna and Barbera founded their own studio, hiring many of their former colleagues, and went on to become the most successful animation producer/directors in history. The last cartoon MGM released to theatres was a 1967 Tom & Jerry, Purr Chance to Dream, produced by Jones and directed by Ben Washam. Later, the studio sold the characters to Hanna-Barbera. Since then, the MGM cartoons have made more money in their endless television reruns, than they ever did in theatres. Even today, they can be seen in prominent time slots on Cartoon Network. But the studio hasn't produced or released any animated cartoon shorts in a long, long time. Text ©2002-07 Donald D. Markstein. Art © MGM.